Which Dishonored ending is canon in Dishonored 2? What you need to know before playing Dishonored 2. Dishonored 2 is out tomorrow, and Phil's working on our review right now. By all accounts it's shaping up to be a worthy sequel, albeit one with troubling performance problems on PC—you can read more about that right here. If you're planning to play Dishonored 2 but it's been a few years since you set foot in Dunwall, then this article is intended as a primer to get you up to speed with the events of the first game. Alternatively, if you'd like to spend the weekend getting caught up the proper way, then this also doubles as a guide to making the 'canonical' choices that will shape the story in Dishonored 2. This applies both to the characters you kill or spare and also your general playstyle, which pushes the world towards 'low chaos' and 'high chaos' states based on how violent you are. It should go without saying, but this article includes heavy spoilers for Dishonored, its DLC, and some of its related media. There are no spoilers for Dishonored 2. The sequel takes place fifteen years after the events of the first game, but it doesn't carry forward whatever choices you made. Instead, Dishonored has a canonical outcome that confirms certain things about Corvo's approach and lets us extrapolate others. The easiest way to break this down is by character: who lived, and what they were like. Both Corvo and Emily can die in Dishonored, but it should be obvious to anybody paying attention that this isn't the case in the canon ending—after all, they're both playable characters in Dishonored 2. In and of itself, that doesn't tell us much. The only ending it precludes is the worst of the 'high chaos' outcomes, with many other playstyles resulting in both characters surviving. The one thing that doesn't necessarily survive, however, is their relationship: Emily expresses distrust of high-chaos Corvo and doesn't embrace him as her father. Given that their relationship has subsequently been depicted as closely familial, this is the first of many suggestions that low chaos Corvo is canon Corvo. I visited Arkane earlier in the year for a glimpse at Dishonored 2 in development, and while I was there they suggested that High Overseer Campbell was one of the targets spared by Corvo. This means that he was branded as a heretic and expelled from the Abbey, and presumably also spared when Corvo later encounters him as a plague-ridden weeper in the Flooded District. The plague probably killed him in the end, but if the low chaos ending is the one we're going with then he could have been saved by the cure concocted by Piero and Sokolov. Rescuing Calista's uncle is an optional objective when Corvo is sent to kill the High Overseer, but the canonical outcome is that Corvo indeed got him out—he's alive in the tie-in novel The Corroded Man. One of the most unusual targets in Dishonored, Corvo infiltrates a party at the Boyle Manor in order to determine which of three identical sisters is the Lord Regent's mistress. Each time you play the mission, the identity of the target sister is randomised—and, of course, you've got the option to assassinate her or arrange another fate. The Corroded Man confirms that Waverly Boyle is the 'canon' target, and that Corvo didn't kill her: he arranged for her to be kidnapped by the obsessive Lord Brisby. In fact, all three Boyle sisters survive the party—again suggesting that a stealthy and non-lethal approach is needed to play Dishonored in a way that is narratively consistent with its sequel. Again, shown to survive in The Corroded Man. This dictates a few of Corvo's choices during Dishonored, chiefly his decision to rescue Slackjaw from Granny Rags in the later part of the game. In turn, this implies that Granny Rags died at Corvo's hand—which Harvey Smith confirmed on Twitter earlier this year. Here's what you need to know about Dishonored 2's performance and settings on PC ahead of day one. They're dead. In the low chaos ending, which is the one we're sticking with, Havelock poisons both Pendleton and Martin before being confronted by Corvo at the end of the game. If he doesn't die by Corvo's hand, Havelock himself commits suicide. The Lord Regent is, canonically, killed by Corvo. The fate of the Pendleton twins is left a little more open. While Dishonored 2 implies that Corvo didn't exactly go on a rampage in pursuit of these marks, if you're replaying the game you're free to deal with them more or less as you wish. Might I recommend staging a drunken staircase accident or arranging for somebody to drop a canister of whale oil at the worst possible time? Harvey Smith confirmed in last week's AMA that Daud is alive, which means he was spared by Corvo—more evidence, if you still needed it, that low chaos Corvo is the official version of the character. However, this also has ramifications for Daud himself, who is the player character in the Knife of Dunwall and The Brigmore Witches. Depending on how much chaos Daud accrues over the course of the two DLCs, he will either be spared or killed by Corvo at the end. This means that the two assassins' canon chaos counts must be low. In fact, it means that the narrative playstyle for both characters is remarkably similar: spare people when you can, and kill as few guards as possible on the way to each target. At the climax of The Knife of Dunwall, Daud chooses whether to spare or execute Billie Lurk after she betrays him for the witch Delilah. She's mentioned in the novel and appears in the comic, confirming that she survived their encounter. Again, this confirms 'good guy Daud' as the canon version of the character. The fate of Bundry Rothwild, Arnold Timsh, Leonard Hume, Edgar Wakefield, the Geezer and Nurse Trimble isn't clear: it's easiest to assume that they're dead or were disposed of, and if you're replaying the game then consider your options open as long as you don't push your chaos too high. At the climax of the Brigmore Witches the witch Delilah is either killed by Daud or tricked by him into trapping herself in the Void. 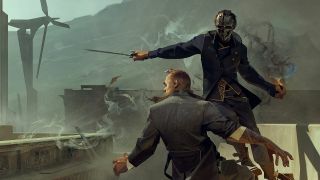 Given her presence in trailers for Dishonored 2—and on the poster packed in with the collector's edition of the game—it's fair to suggest that she survived her encounter with Daud. Given that she's a witch, however, there's a lot of different forms 'survival' could take—but as we're already considering a low chaos approach for Daud, 'trapped in the Void' seems like the most likely canon outcome. At least, trapped in the Void for now.